(a) Engage the 2 claws to install a new charcoal canister leak detection pump sub-assembly to the charcoal canister assembly. Do not allow foreign matter such as grease, oil or water to adhere to the O-rings. Ensure that the claws are engaged properly. 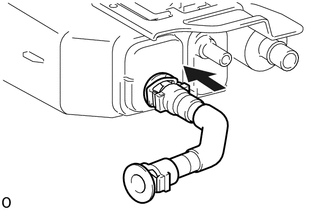 (a) Align the fuel tank vent hose sub-assembly connector with the charcoal canister assembly, then push in the fuel tank vent hose until the retainer makes a "click" sound to connect the fuel tank vent hose sub-assembly. Check that there are no scratches or foreign objects on the disconnected parts of the fuel tank vent hose sub-assembly and charcoal canister assembly before performing the work. 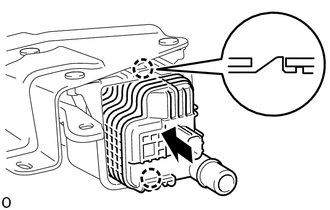 After connecting the fuel tank vent hose sub-assembly, check that the fuel tank vent hose sub-assembly is securely connected by pulling the quick connector. (a) Install the charcoal canister assembly with the bolt and 3 nuts. (b) Engage the guide to install the wire harness bracket. (d) Engage the clamp to install the wire harness. (e) Connect the 3 connectors. (a) Align the fuel tank vent hose connector with the charcoal canister assembly, then push in the fuel tank vent hose until the retainer makes a "click" sound to connect the fuel tank vent hose to the charcoal canister assembly. Check that there are no scratches or foreign objects on the disconnected parts of the fuel tank vent hose and charcoal canister assembly before performing the work. 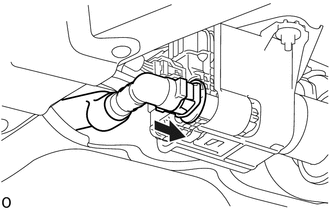 After connecting the fuel tank vent hose, check that the fuel tank vent hose is securely connected by pulling the quick connector. (a) Connect the charcoal canister fuel hose with hose clip.